I’ve been wandering the streets of New Orleans in Louisiana for almost an hour, looking for a building that remotely resembles a museum. But as if under a spell, all the iron-wrought balconies of the French Quarter began to look the same. The French Quarter is a hub of activities in the evening, with loud music blaring from pubs and tourists traipsing in drunken glee along Bourbon Street. If you visit in the daytime, though, the area is eerily quiet. Just as I’m about to turn around and grab some beignets at Cafe Du Monde, a wooden signboard catches my eye. The banner – like the museum’s building – looks old and unassuming, but there’s no mistaking the words on it. Red paint that vaguely resembles dried blood spells out in bold: “VOODOO”. 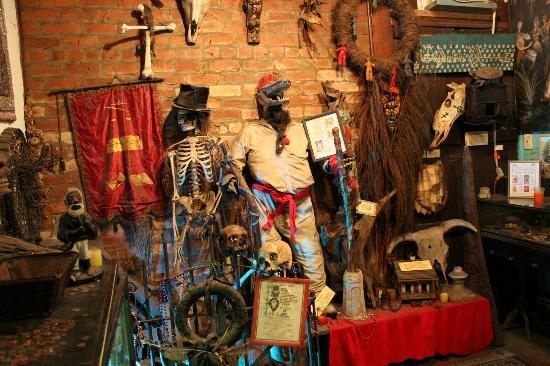 I have finally found the New Orleans Historic Voodoo Museum! Here in the Big Easy – or Nola, as the city’s hip young crowd calls it – voodoo is as big as Mardi Gras and jazz music. Not many cities openly display its belief in the supernatural like New Orleans. But that’s probably because voodoo is deeply rooted in the city’s history. Voodoo reportedly came to New Orleans in the early 1700s, brought by slaves from West Africa. Today, the craft is still practised by a sliver of society in the city. The museum is located in the heart of New Orleans’s French Quarter between Bourbon and Royal Streets. With about 15 minutes to spare before the museum closes at 6pm, I say a quick prayer and push open the black French doors. The cramped interior is dark and stuffy with the scent of burning incense. From the corner at the reception desk, a Caucasian woman in oversized glasses peers over from the newspaper she’s reading. “Are you still taking visitors? Can I come in?” I ask perhaps a little too meekly, nerves choking my throat. To be fair, you don’t need a long time to explore the venue. Despite its name, the museum is just made up of two rooms and a hallway. Maybe it’s my hyperactive imagination, but I could swear I heard quiet whispers. But with the exception of the woman at the reception, I’m completely alone in the museum. Packed within the small space are all kinds of voodoo exhibits. Some are bizarre, while others are downright disturbing. The hallway is primarily dedicated to famous and powerful voodoo priestess Marie Laveau, with portraits believed to depict her. Despite the legends surrounding the woman’s power, there are actually very few verified details about her life. 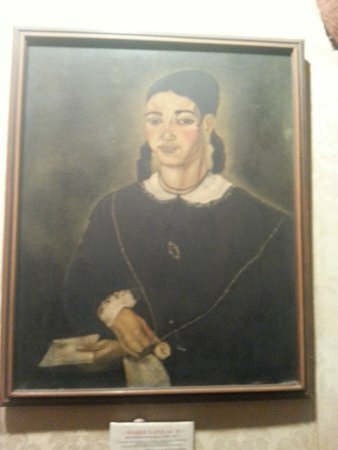 Portraits of renowned practitioners, such as Marie Laveau II here, are hung on the walls of the museum. Stories that were passed down claimed that she sold gris gris (charms made from a combination of ingredients) and had the power to save condemned criminals from death sentences. Her daughter Marie Laveau II is also a renowned voodoo practitioner. Some locals believe that Marie Laveau still wields her supernatural power from the grave. Walking into one of the rooms, I’m greeted by an array of altars. Some are dedicated to voodoo spirits, while others to deceased members of the faith. On the altars are various offerings: Mardi Gras beads, loose change, cigarettes and photographs. There’s also an extremely detailed depiction of how to make a human zombie. Apparently, all you need is poison extracted from a blowfish. Then lace it on the shoes of your enemy before feeding him an antidote to produce a living dead effect. In another room, dolls with pins stuck into them as well as paintings of half-naked devotees dancing under the moonlight gave me goosebumps. Too engrossed, I suddenly bump into a low-lying ceremonial stool with an ominous “DO NOT SIT” sign. Another sign above the stool warned that if any visitors dare to touch the items, they will be cursed with bad juju. Oh fudge, am I cursed for life? Startled by this little accident, I immediately recite the names of all the Chinese deities my Hokkien mother taught me as a kid. Within seconds, I’m already out of the museum and half-running towards Cafe Du Monde in search of salt to purify my soul.